The new classroom at the Marine Corps Recruit Depot is Penn State's first on a military installation. SAN DIEGO, Calif. — Penn State’s new classroom at the Marine Corps Recruit Depot San Diego will help further its commitment to military students and expand their access to higher education, said university leaders during an Aug. 18 ceremony to dedicate the facility. The university will teach the first course at the on-base classroom during this semester, with a goal of transitioning students to complete their degrees online through Penn State World Campus. 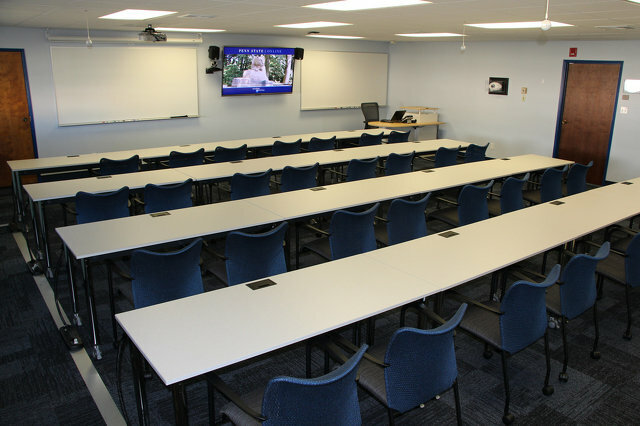 The classroom is the university's first on a military installation. Col. Mark Tull, chief of staff at the Marine Corps Recruit Depot San Diego, said leaders at the base look forward to the benefits a Penn State education can provide. The classroom was unveiled after a ribbon-cutting ceremony attended by Weidemann and other representatives from the university, including Ryan J. McCombie, chair of the World Campus Military Scholarship Program; Avis Kunz, the assistant dean for online education and outreach for Penn State’s College of the Liberal Arts; and Alexander Siedschlag, a professor of homeland security at Penn State Harrisburg.